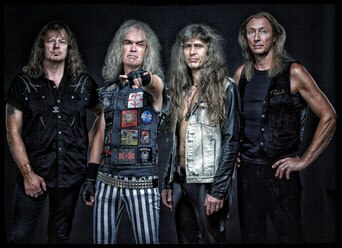 In the 1980s GRAVE DIGGER shaped the elite of the German metal scene. Besides the handmade instrumental perfection, their debut "Heavy Metal Breakdown" contained keyboard lines which was against all the heavy metal rules. But within no time the sound of GRAVE DIGGER was well known for its virtuosity and uniqueness. Thus, Chris Bolthendahl and his musicians still perform the well known GRAVE DIGGER sound which is celebrated all over the world. Their nineteenth studio album "Healed By Metal" was released in January 2017.